The Pragmatic Programmers have published quite a few books over the years. My bookshelf contains nearly a dozen of them. 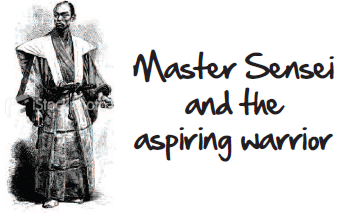 The latest addition being The Agile Samurai: How Agile Masters Deliver Great Software. It’s essentially a high level overview of agile practices, with a focus on the why and the how. Unlike some other books on Agile, this one tries to remain pretty neutral when it comes to methodologies. XP, Scrum, Kanban are all briefly mentioned, but the author managed to boil Agile down to its essentials: common sense, being goal oriented and having a willingness to improve. The chapter on Agile Planning is a particularly excellent treat. It could have easily been called “the idiot proof guide to agile planning”, because really, it’s that good. Concepts like velocity and burndown are illustrated with pretty graphs. Not only does the book explain how to apply agile planning, but by the end of the chapter you’ll also know why it’s a good idea. The phrase “Why does reality keep messing with my Gantt chart!? !” sums it up pretty nicely. I have just one problem with the book. The Samurai theme could’ve been explored a bit better. For starters, this here Samurai is wearing his swords on the wrong hip. Second, his name, Master Sensei is a bit silly. Ō-sensei would’ve been much more appropriate. But in all seriousness, the whole Samurai theme could’ve been expanded on. There are many similarities between software development and martial arts in general. Mostly when it comes to drive and focus, a bit less so when it comes to actual sword wielding. Still, it doesn’t detract from the book, so all is well. Hi Bram. Thank you for reviewing the agile samurai. Glad you liked the planning chapter. I worked to make people see how planning a software project isn’t all that much different than planning for a busy weekend. Thanks again. All the best in your projects this year. You’re very welcome, of course. Swords and code proved helpful, my dirty mind however was of very little use here. I’ve yet to find a book that manages to combine all three ;-). But in all seriousness, you did an excellent job on the planning chapter. That one alone makes the book worth buying.